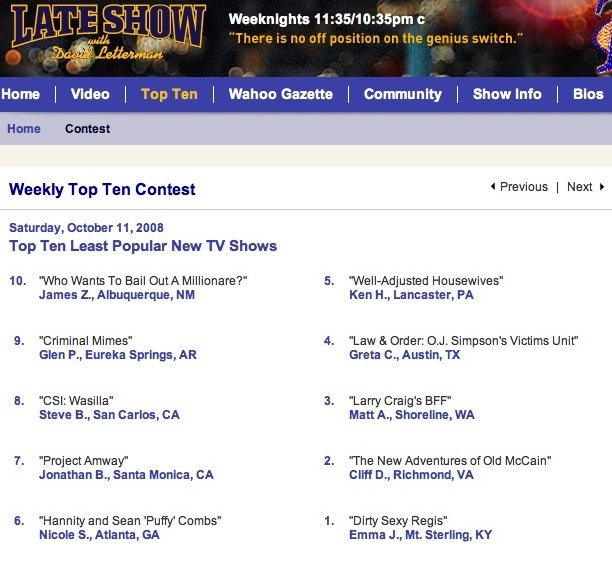 In 1998, I submitted for the Late Show with David Letterman. 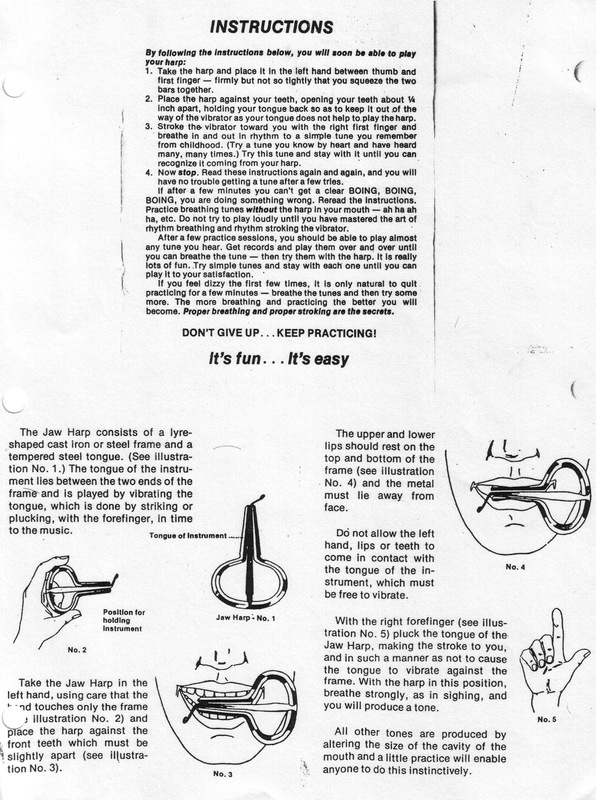 My comedy packet caught the eye of an executive at Worldwide Pants named Kate Adler. She invited me to CBS for a meeting — it remains the best meeting of my career. Adler was supportive, knowledgeable and funny. Adler sent my submission to the head writer of the Late Show, Tim Long. He liked my stuff enough to want to do a phone interview. We spoke for a while, and he finished the call by saying "Your submission is really funny — all you'll have to do is meet [executive producer] Rob Burnett and you're probably good to go." It looked like my lifelong dream of writing for David Letterman would be coming true. 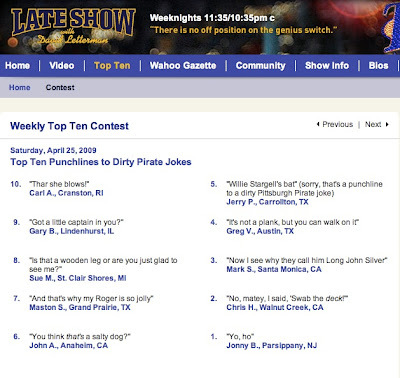 Then Tim Long quit the Late Show. Long became a writer on some cartoon show. A great career move for him, but it had a butterfly effect on mine. For a while, I ended up in limbo. At some point, Adler from Worldwide Pants called and assured me that I'd be hearing from them again. Months went by, and I didn't hear from anyone. It took so long, I forgot about the whole thing, drowning my sorrow in question writing for Win Ben Stein's Money and then Singled Out. But I finally got the call — the Late Show's new head writer would like to interview me. In person. Shortly after, I received a plane ticket in the mail. I flew out to Manhattan where the show had booked me a room at Le Parker Meridien. With a view of Central Park. The interview with the new head writer was the polar opposite of my meetings with Kate Adler and Tim Long. To say it went poorly is an understatement. I won't go into the details, but it wasn't really my fault. (One of the first questions was "So [the head writer of the show I worked for] is sleeping with [the female star], huh?" which is kind of an unanswerable question at a job interview.) I dodged the question, and that didn't seem to sit well with my interviewer. The brass ring had slipped away. Years later when I read that the head writer with whom I'd interviewed left the show, I called my then-agent at William Morris. "The people at Worldwide Pants liked me, Tim Long liked me... the only one who didn't like me is the guy who isn't there any more. Can I get another interview?" I asked him. 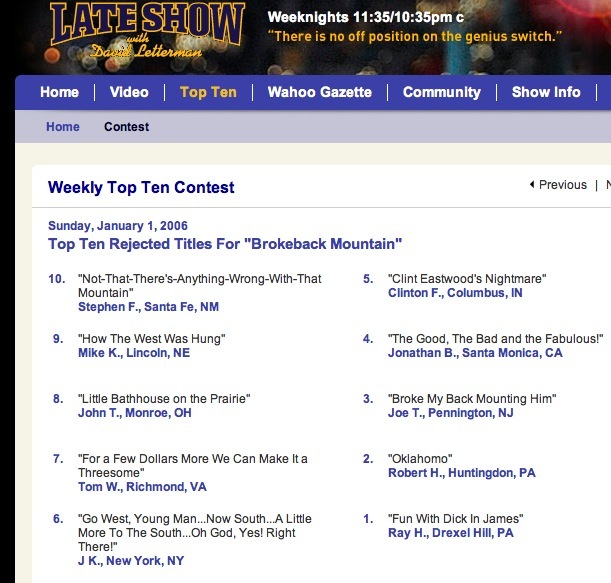 My agent responded by saying, "I don't really know anyone over at the Late Show." I blinked a few times and responded, "You should get an agent. I hear they're helpful at opening doors." I'm not bitter that I missed my shot at writing for Dave. I think about it this way: When I was 12 or so and living in Parsippany, New Jersey, I used to wait until my parents went to sleep and then sneak downstairs into the living room to watch Late Night with David Letterman. I'd turn the volume way down so my parents wouldn't hear the TV. Consequently, in order to hear the jokes, I'd have to sit with my face right up against the television. Years of watching Late Night centimeters away from the TV has probably made me sterile. So the idea that someday I'd actually have a legitimate shot at that dream job is astounding. 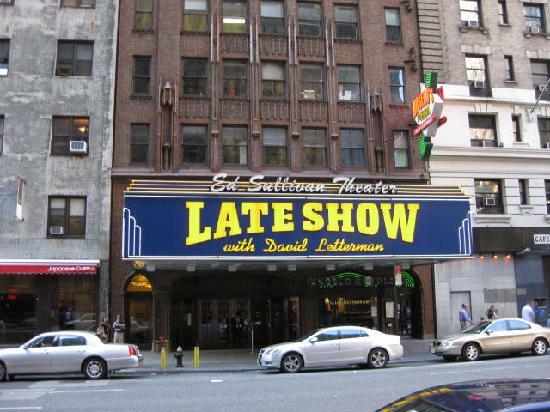 To be invited in to the upstairs offices of the Ed Sullivan Theater is enough. 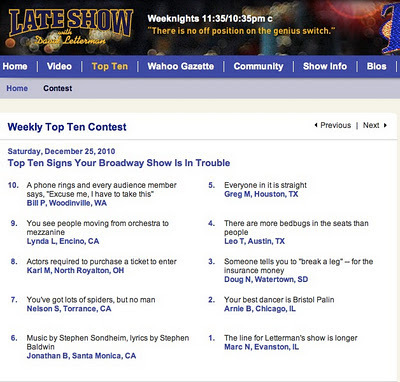 I still enter the Late Show's online Top Ten Contest from time to time. It's sort of like scratching my phantom comedy limb. Prior to this week, I'd made it on the list three times. I forget the first one. 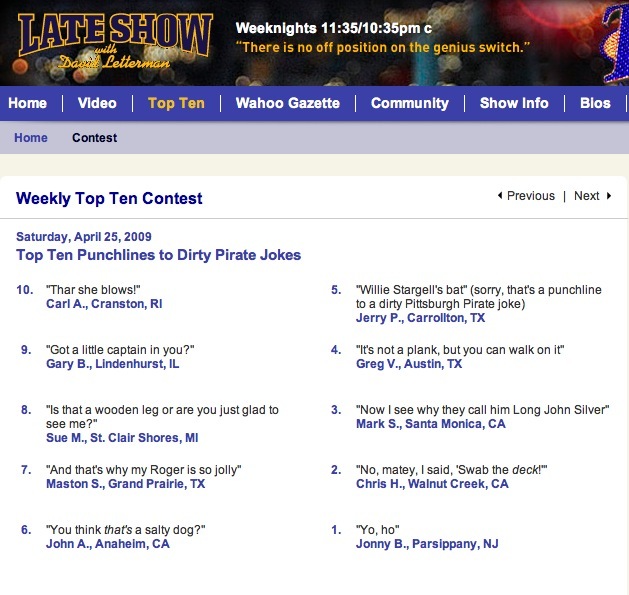 My rewards for winning were a Late Show cap, a Late Show t-shirt and a Late Show mousepad. On Christmas 2010, I made it onto the list for the 5th time. I wish I were being offered The Job instead of a t-shirt. But I'll settle for knowing that I can still make the list. 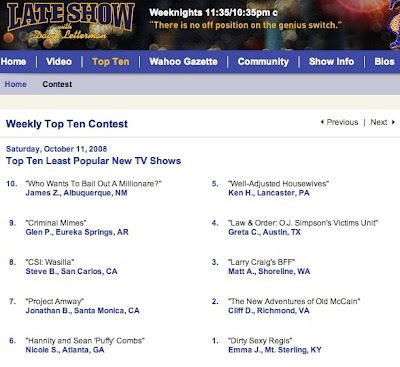 This post has been updated several more times as I continued to be lucky enough to make it onto more Top Ten Lists. 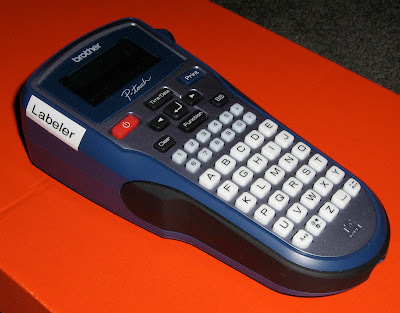 How could I not label my labelmaker?